for another episode of Vintage Thingies Thursday. 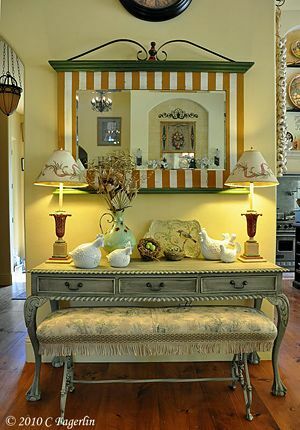 Bring out some of your favorite vintage things and join the party! 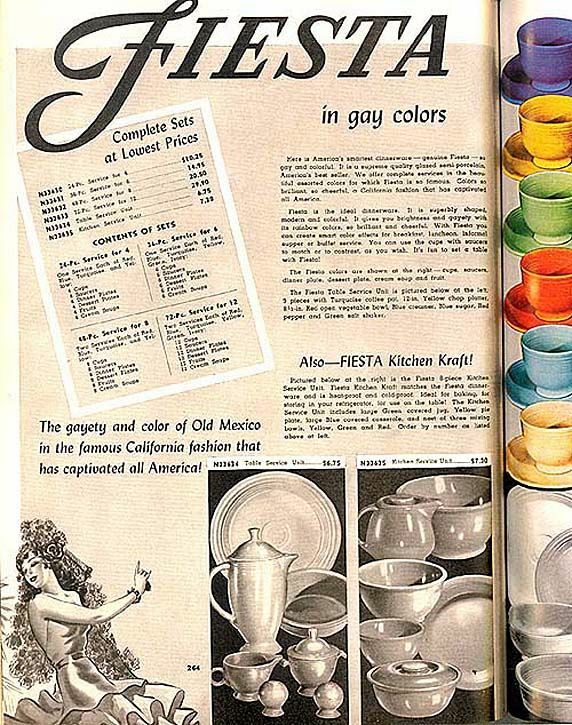 produced by the Homer Laughlin China Company beginning in 1936. 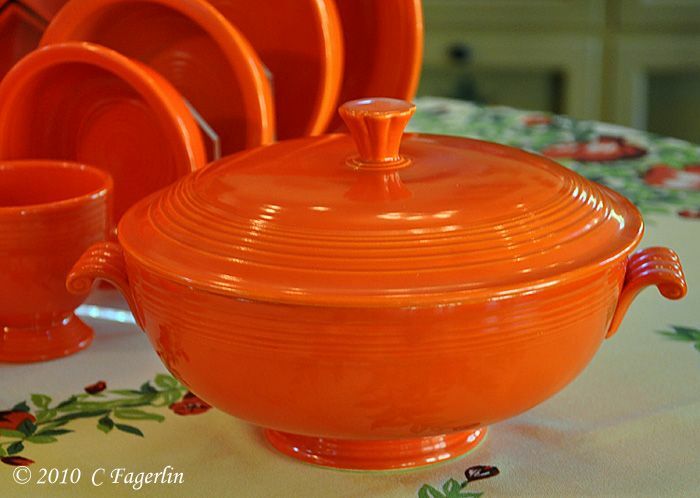 This week's color is vintage Red, often referred to as "orange" by non-collectors. Red was most always priced higher than other colors in the line. 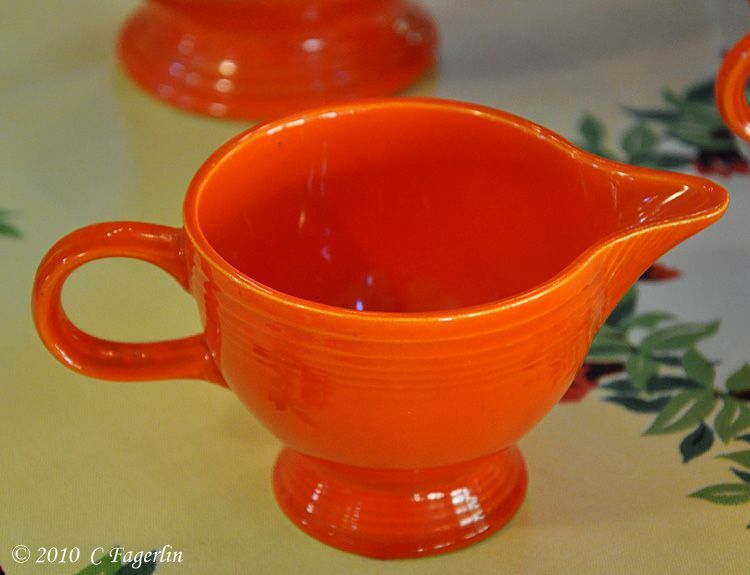 wartime restriction on the sale of uranium oxide needed to produce the Red glaze. 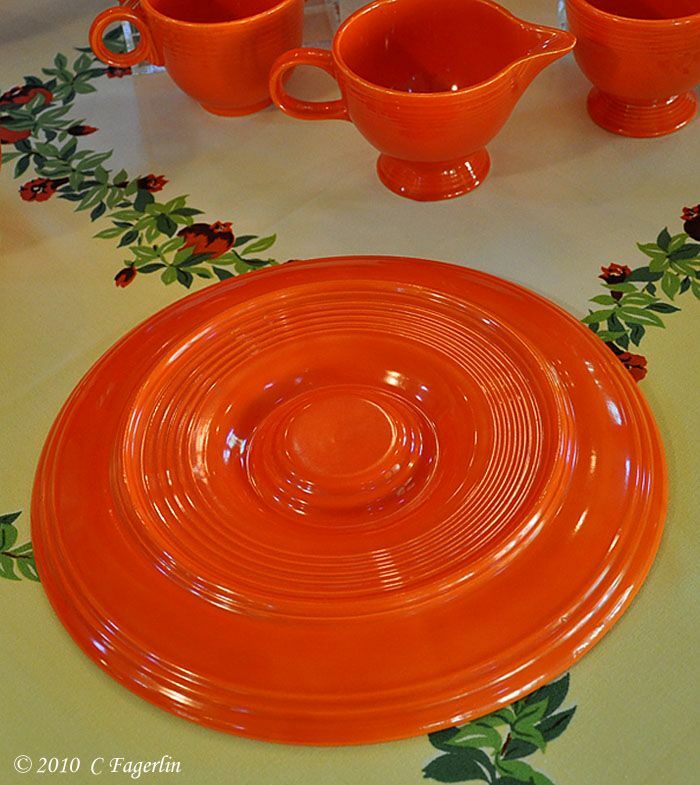 "Mango Red", when it was used to glaze items in the Ironstone Fiesta offerings. 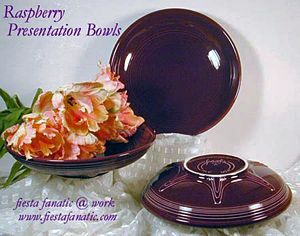 Shown above are examples of Fiesta glazed in Red from my collection. Most are pretty common and easy to come by in good condition. 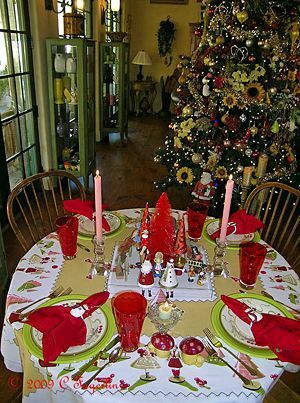 The Covered Sugar Bowl in the center of the image and the "C-handle" Creamer to the left are from the Ironstone Fiesta line produced from approximately 1967-1972, when the color was called "Mango Red." It is the same red as the other items from 1936 forward and the name change was probably a marketing move. Fiesta color. 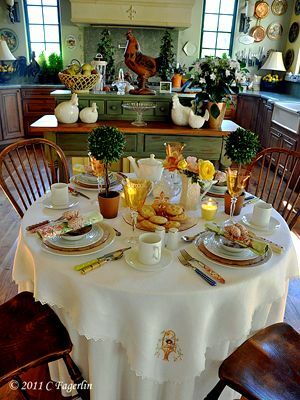 There is thought to be one in Cobalt Blue at the Homer Laughlin China Company. This is the 10 1/2" divided plate that never went into production. 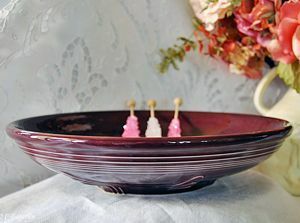 Four different models of this one piece relish were done in 1937. The back of the divided plate shows no markings. It is one of maybe three or four items in my collection that I truly treasure! 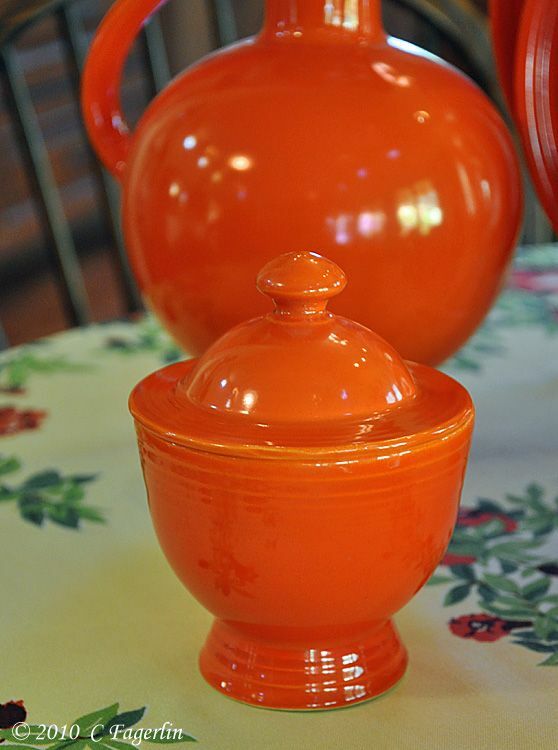 Above and below: Ironstone Fiesta "Mango Red" Creamer and Covered Sugar Bowl. take apart the layers of plates and detail their sizes. 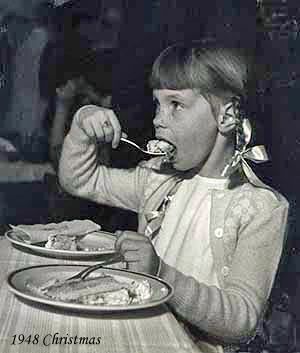 Thanks for joining all the participants in another week of Vintage Thingies! 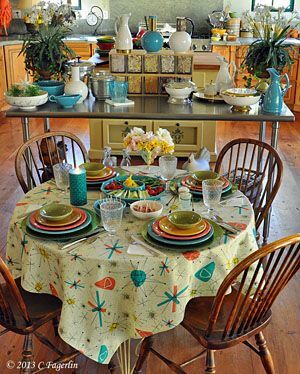 wonderful and very colorful dinnerware. Bright and cheerful as usual. What could be next? I'll have to wait and see. How foolish I have been. 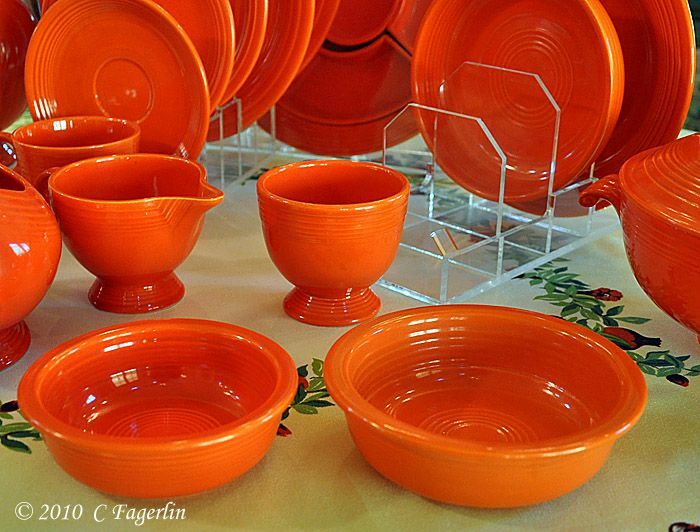 My mother had a big set of these dishes but they were all various colors. I had them a long time, then got a wild hair and sold them. I look back, and sorry for a lot of mistakes I made. 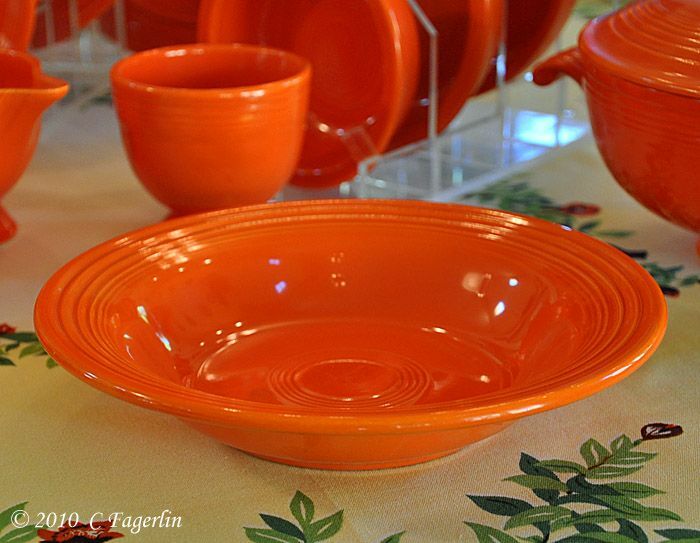 This color truly lives up to the name of fiestaware, it looks like a party. Great that you know so much about it, what a lovely collection. Happy VTT! Beautiful! I found a Fiesta pitcher at a yard sale and was ecstatic. 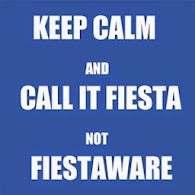 My daughter said, "What's Fiesta?" Doohh! 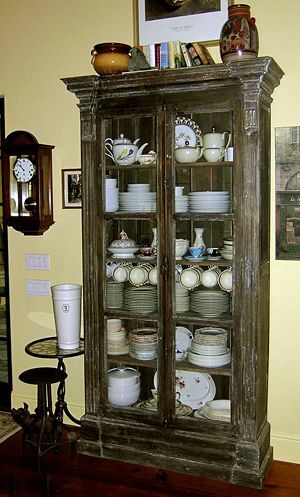 Your collection is amazing, especially the rare divided plate! Oh just gorgeous! I really love the shape of the tea (tea?) pot, so curvy and funky! Thanks for sharing! What a wonderful collection! I love all the Fiesta colors. 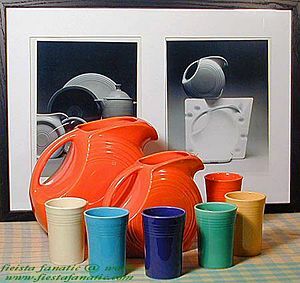 I just love your knowledge of Fiestaware. I have never seen a covered casserole before so I will have to be on the lookout for one now. 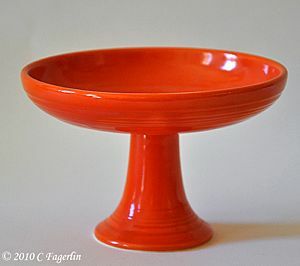 I just love the shapes of these pieces, the clean lines and curves, not to mention that great red. It just makes you want to use them, doesn't it? It's wonderful to see these profiles of your Fiesta! That's how it all got started, after all! 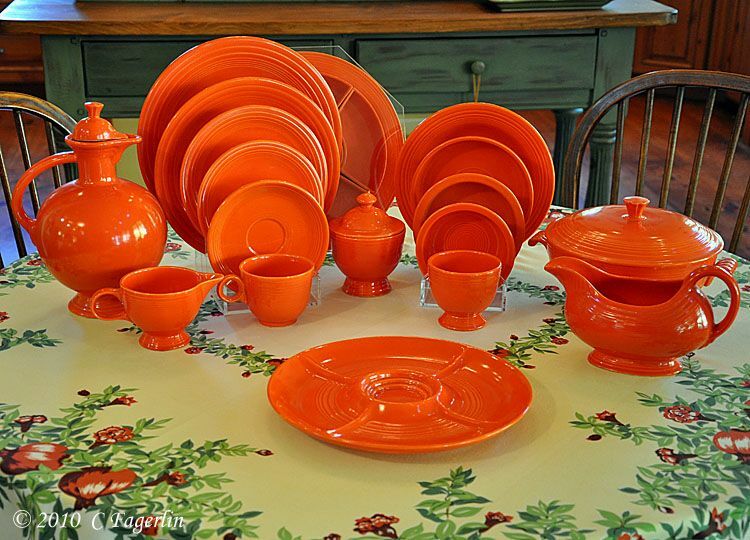 What lovely dishes....I simply love the cheery orange...and for the record...LV (earlier commenter) is my aunt...and I wish she had kept them too!! LOL.....have a great VTT! 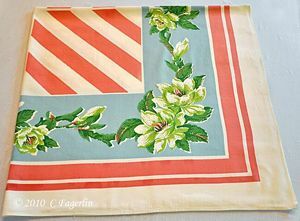 How wonderful to have such a rare piece in your collection! Is there a good story behind finding your divided plate? - and did you know when you bought it how rare it was? I hope I'm not being too snoopy! Delightful! 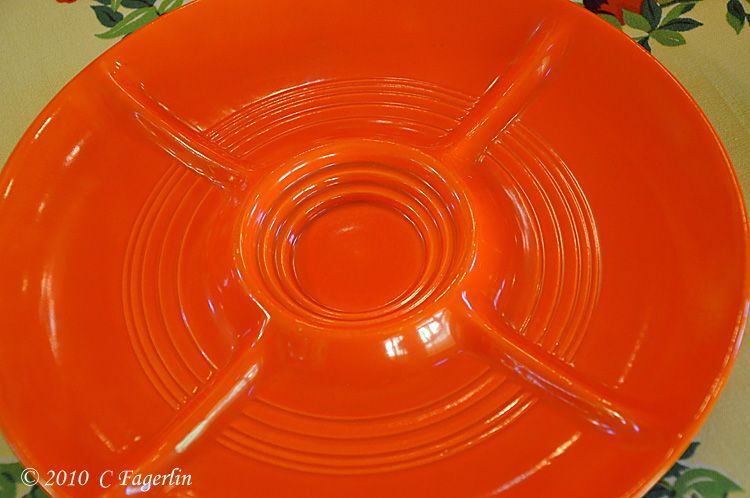 Its wonderful that you have one of the divided relish dishes: your collection is so fantastic and so diverse, you really deserve to have a rare piece! 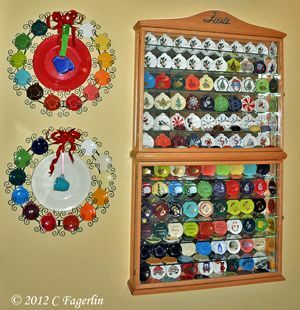 Thank you so much for sharing all of your Fiestaware. 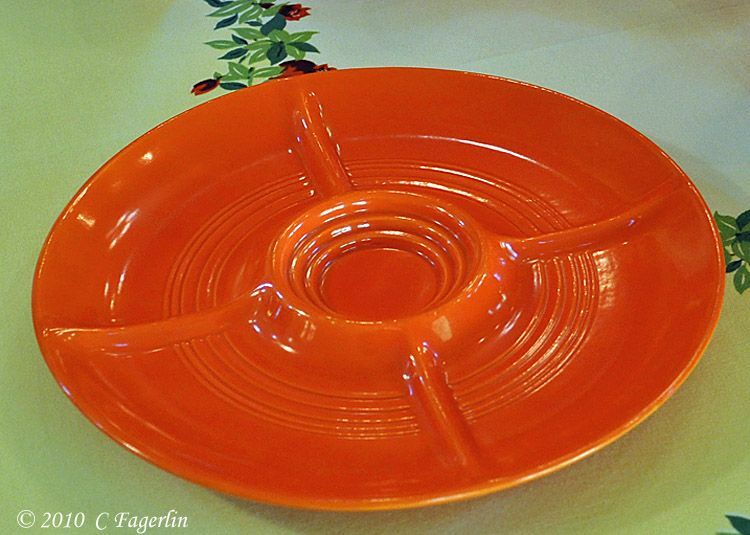 How marvelous to have that red divided plate that is one-of-a-kind! I always learn so much from your posts. Thank you for sharing your knowledge! 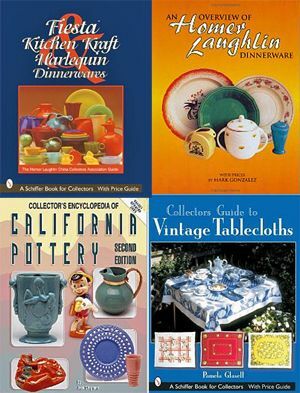 What a wonderful collection you have and how great to have the brochures too, so much fun! 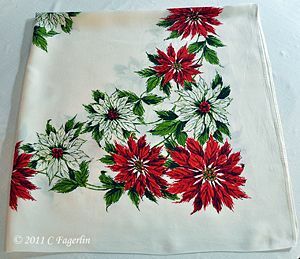 Daphne - you and I remember when I started my first venture on the internet all those years ago! It really is very strange when I look back at the images from 1998 and wonder how we put up with the minimal quality of them! How times have changed, but the Fiesta is still as beautiful as ever. Gayle, I'll give you a hint about "what's next". It will be either Yellow or Green or Cobalt! 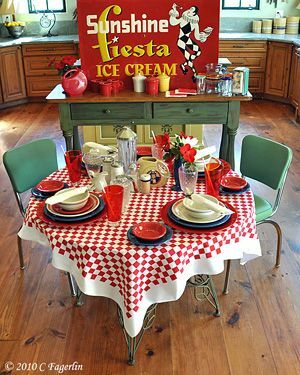 I love Fiesta too :-) I am having a CSN Giveway on my blog My Dream Canvas and would love for you to drop by. 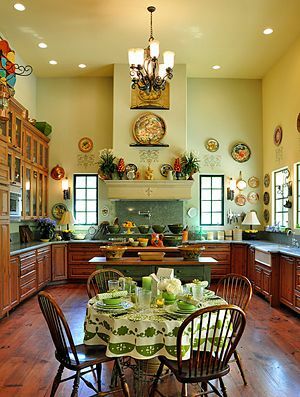 Lots of Fiesta lovers around so you will feel right at home! 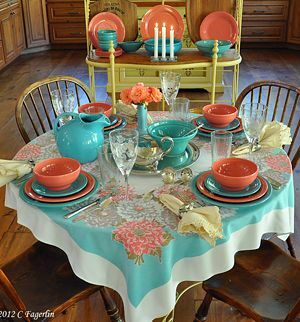 Love, love, love the colors!!! For your convenience, Here Is My Show and Tell Bargain Link. Hope to see you visit with me. What a beautiful collection!! They are gorgeous! 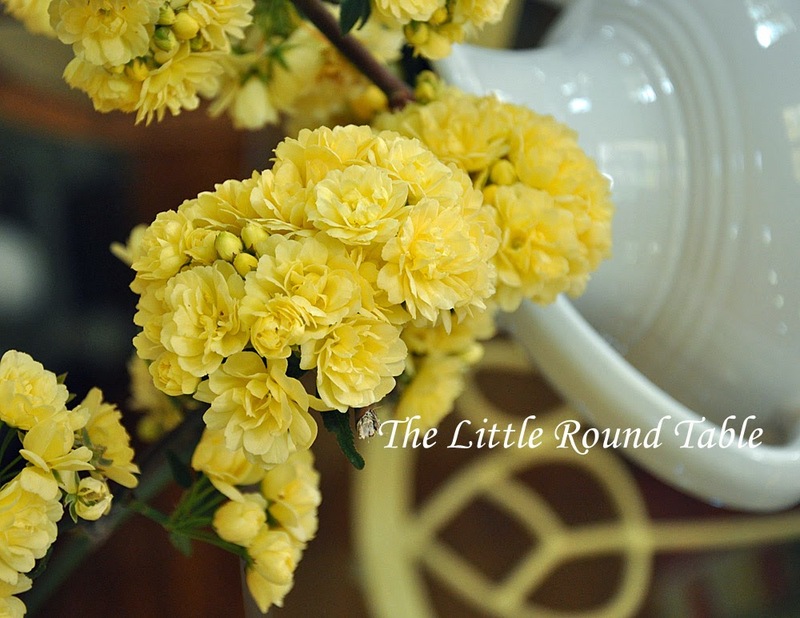 I only have 2 tea cups and saucers in yellow in fiesta ware!! Thanks for coming by ladies! 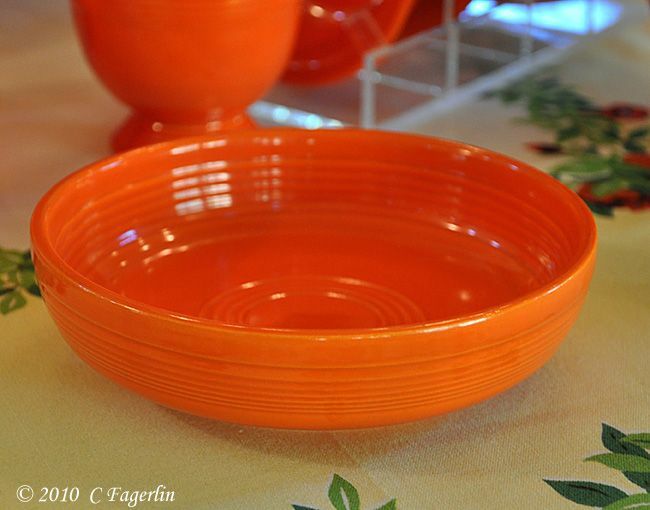 Tune in next week for another shot of Fiesta color to brighten your day! The Finch Buffet is OPEN! Show and Tell Friday - What Should I Wear Today? PAPRIKA + Poppies = Pizazz! Rednesday: In The Garden and Some Spices! I Heart The USA - Happy Mosaic and Blue Mondays!